We love looking to nature for the perfect gateway to healthy hair. As we continue to travel down the road to beautiful hair through nature, we are bound to discover ingredients that become superstars overnight. Oils and herbs which have been used and loved for centuries are being rediscovered and more accessible to all of us across the globe. Previous all-stars like coconut oil or argan oil were once the “it” oil for moisturized and healthy hair but they must step aside as new ones take their coveted place. It is hard to believe nay oil can but there is a new oil is making waves in beauty as the oil to replace argan oil for healthy hair and it is roucou oil. Roucou oil comes from the annatto plant, which is native to the Amazon rainforest, Africa, and even Asia. This evergreen shrub is also known as bixa and achiote and is sometimes called the lipstick tree because of the pink flowers and spiny red fruit. The oil comes from the fruit attached to heart-shaped leaves and flowering occurs throughout the year with February to April and October to November being the two most abundant periods. The oval-shaped fruit has 2 valves and is covered with numerous soft, bright red spines that contain about 50 seeds. 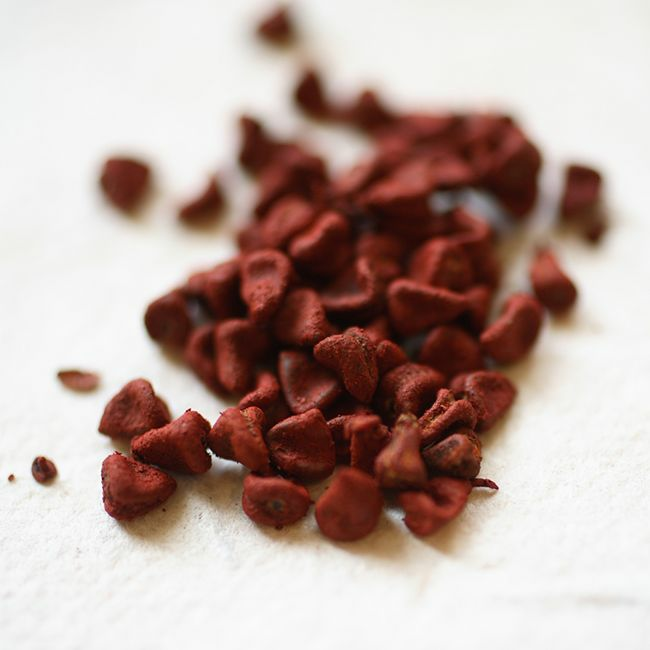 Those seeds are covered in a vermillion coating, which is the actual source of the dying power of the fruit. The oil is harvested from the seeds of this heart-shaped fruit and the rich color is used as a dye. Roucou oil is rich in beta-carotene along with ellagic acid, which helps to neutralize free radicals. Roucou seeds contain alpha and beta-carotenoids, proteins, saccharose, cellulose, bixaghanene, bixeine, bixol, crocetin, ishwarane, isobixiine, phenylanine, salicylic acid, threonine, acid tomentosa, and tryptophan. The seeds have been used to make teas, astringents, and anti-inflammatory products to treat dysentery, fevers, and skin problems. It was even used as an antivenin against snake bites. Today, the dyeing power of the seeds creates a colorful paste for coloring cheeses, soups, and often replaced by saffron. Roucou oil is being called the hair whisperer because of its amazing sunscreen, antioxidants, and even photo protective properties. It also has antibacterial and antiseptic properties, which is great for the scalp. The biggest contributor to hair would be the protection it gives against UV rays and sunburn that the scalp can easily suffer. Roucou helps with hair coloring because it is 100 times richer in beta-carotene than carrots and the oil stimulates the production of melanin, which is responsible for hair’s natural color. The melanin keeps grays and frizz at bay and roucou oil lower cellular damage from sun exposure. That just means it helps with hair aging! The emollients in the oil help with hair hydration, detangling and help to add sheen to hair. Now, many would assume that this would be an unfair fight. Argan oil is a curly girl’s darling asset but roucou oil is the winner as it can do everything argan oil can do but with the hugely added bonus of having built-in SPF. This is why many are touting roucou oil as the new argan oil and while it seems hard to find by itself, a few brands are adding it into elixirs like Davines OI All in One Milk. While it may be hard to find now, the thirst is on and we will be seeing more of this oil in elixirs in more products soon. Love oils? These are the most popular oils for curly hair. In a hair rut? Follow us on Instagram for inspiration.